Well it has been a while hasn't it. I feel like the last 6 months have whizzed past. I am now married and have a new job that I start on the 1st August which is all a bit mental. As my wedding consumed my life for almost two years it wouldn't be right if I didn't blog about it so my returning post is the first in a series of wedding themed items. I am also going to be turning the blog into more of a lifestyle blog rather then just fashion because I have decided I want it to be able to look back at is a dairy of what I go up to, as well as cringing out some awful outfits and praising the good ones. So lets begin with my first 'The Wedding Series' entry. 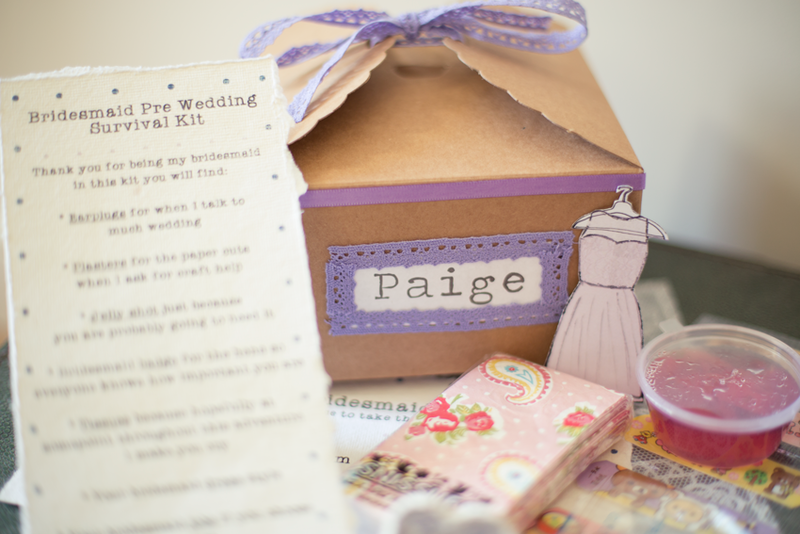 One of the items I wanted to create for my lovely Bridesmaids was a box of goodies so here is what I put together. I ordered the boxes from aliexpress they are kraft boxes with a lovely waved edge. As the colour theme for the bridesmaid dresses and part of the wedding was purples I had to decorate them with purple ribbon and lace, both from The Range. Inside the box was a list of what it included, along with the odd spelling and grammar mistake because my English is not the best (and it wouldn't be something I made without it, it took me a good few attempts to get the wording correct on the invites). I had drew/traced a drawing of the dress style each bridesmaid was having. I have a very talented Mum who made all ten bridesmaid dresses. The bottom was the same on all the dresses but the girls had five different top styles to choose from. As they choose the top of their dresses a few weeks after I got engaged I decieded to print out the drawings of them so they had a little reminder of their style. 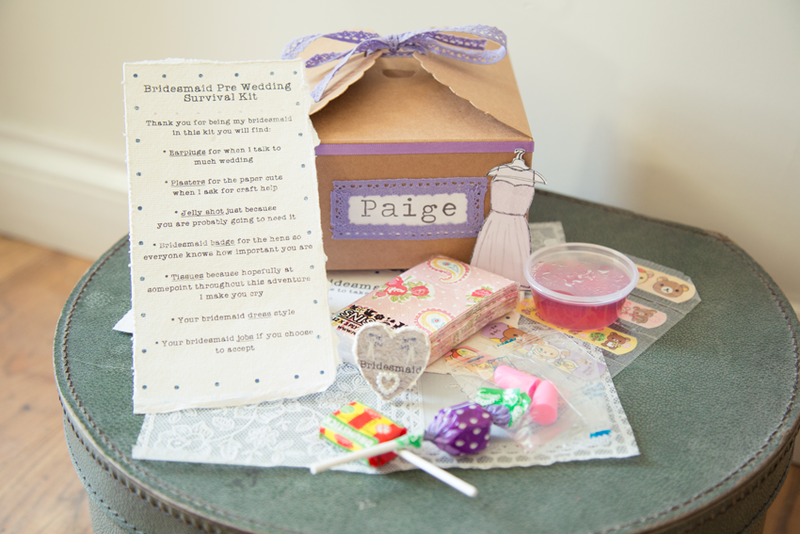 The box was also filled with some essentials; pretty tissues and plasters from eBay, ear plugs because I knew I would be chatting wedding for a year and a half, sweets and a homemade vodka jelly shot. They also had their save the date in the box (next post will be on these). Finally it all got finished off with a homemade bridesmaid dress all fitting in with the theme of the wedding, lace and pearls. 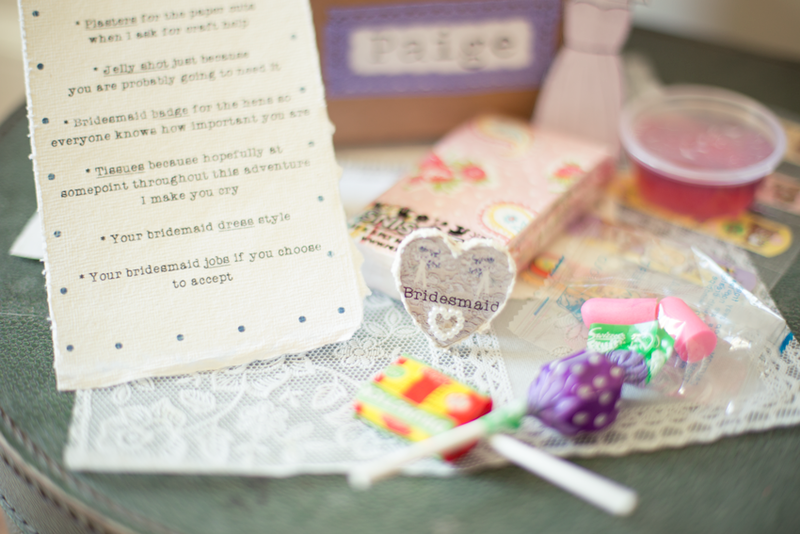 I brought the wooden heart badge templates and badge backings from eBay and then decoupaged the bridesmaid text with the printed lace onto the wood. I added some ribbon round the edge with double sided tape and stuck the pearl heart on with all purpose glue. They were actually really easy to make and just topped the whole box off. My favourite thing about these boxes is when I go to some of the girls houses I still see them on their shelfs, it is a nice feeling when you work hard on something and it is appreciated. So there you have it my first entry on 'The Wedding Series' and my first blog post in 6 months. Hope you enjoyed and I look forward to being back with more.